From kindergarten on up, every teacher preached the importance of Reading, Writing, and ‘Rithmetic. Those lessons are key to success in life, for sure. But when it comes to commercial real estate and construction, we could all benefit from remembering these “3 R’s”: Reuse, Reduce, and Recycle. So how does that baseline become evident in today’s market? Holton Brinson is a broker at Jordan Trotter Commercial Real Estate. He says building materials, high-efficiency mechanical systems, and smaller building footprints are just a few examples of how businesses are going green. “The days of the massive executive corner office are over,” Brinson says. “Cubicles, community work tables, and small offices are taking their place.” Even restaurant kitchens are shrinking without compromising food quality and seating space for customers. People used to think good design meant having to sacrifice sustainability. Now the two go hand in hand. Dickinson says really great designs make the public more aware and the space more valuable, but other green initiatives aren’t easily noticed by the public. Jordan Trotter developed the Dollar General at the corner of Joy and Wheeler Roads in Augusta. It incorporates a vestibule on the front of the store that goes unnoticed by most busy customers. The vestibule contributes significantly towards maintaining comfortable temperatures in the store despite the doors opening hundreds of times per day. This investment reduces the stress on the energy efficient mechanical systems and lowers the overall energy requirements for the store. When it comes to some of the most popular sustainable design options, the sky really is the limit. Daylight harvesting is among the most popular choices. “This involves a lighting control system that has sensors that control artificial light levels in response to natural lighting,” Dickinson says. “As natural light conditions change, the system dims or brightens the artificial light to maintain desirable light levels.” It can also help the business owner maintain desirable power bills. The more sun that shines in your office, the lower your energy costs. 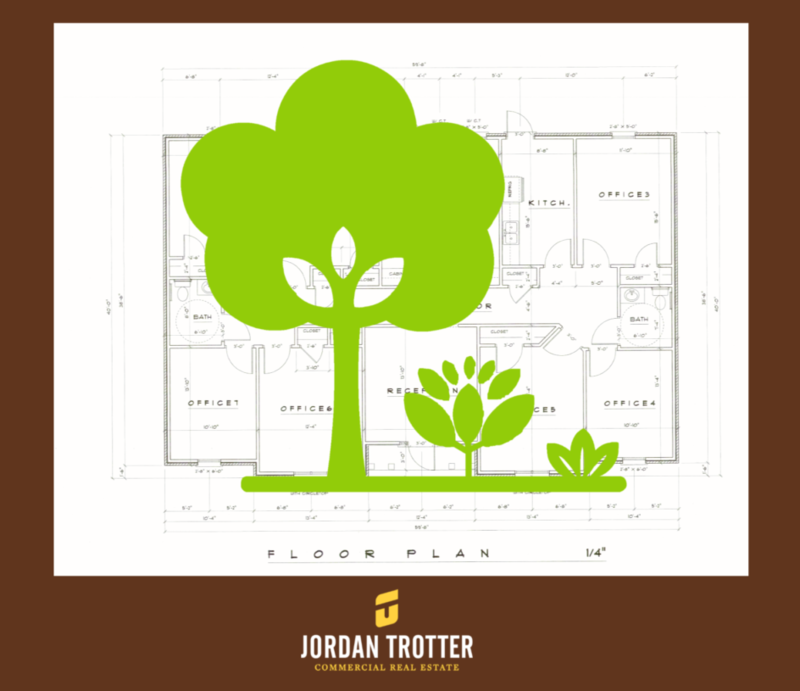 You may pay more up front for sustainable design concepts but you will reap the rewards in the long run. If you’re looking for another key reason to go green, consider this: Uncle Sam is a big fan of sustainability. Dickinson says companies that renovate or build can get substantial tax incentives if the construction meets the minimum “green” standards for the interior lighting, HVAC and building envelope, which help offset the initial capital costs. Dickinson says when it comes to going green, there are different paths that offer varying results. He says it can be fairly simple for someone who just wants to practice sensible design and construction. You meet the baseline requirements and then decide the aspects that are important to you. If you want to use the project’s sustainable status for marketing purposes, there are ratings systems such as LEED. This includes measurable levels of implementation that can be awarded to a project. When you achieve those levels the project can be advertised as LEED certified. Maximizing goals while minimizing space. Efficiency over expansiveness. Going green by letting a little sunshine in. When it comes to the strengths of sustainability the list is limitless. So, when it comes to your company’s next step don’t be afraid to incorporate some of these practices in your plans. Your employees, your customers, and even your budgets will appreciate it! ← Millennials: Are they having an effect on the commercial real estate market in Augusta?